Tuesday this week, we ventured over to Arthur’s place for our regular meeting. On his layout, he had his new oil tankers running circuits on the QR track. They look very nice. Arthur, does some very nice modelling work. The rest of the night is then spent sitting around his tables in his garage chewing the fat. It was a very good meeting. On Wednesday while the various ANZAC day marches and dawn services where on TV, I went down to the shed, turned on the TV, and started to investigate if I could make quite a few more water stand pipes for placing in various crossing loops on the layout out of pieces of styrene. Well I did cut up various sizes of styrene tube and cleaned them up. I will need to work out how to effectively bend the various tubes if this project is to be any sort of success. May be I might have to use some brass sections, and see if I can bend these a bit easier. Yesterday quite a lot of Tuesday night crew went down to Darren’s place, as he put on a Tuesday Nighter’s BBQ lunch. Darren lives very close to Whoop Whoop, well not that close, but at least you can see Whoop Whoop from there. He makes the trip up to our places in suberbia every second Tuesday night, and this was his thanks for opening our houses to him. Well I was picked up by Shelton who already had Cliff in the car, and David who also drove to my place, and we all travelled together. So we car pooled to Darren’s, and were met there by Greg, Arthur and Peter, and were soon joined by Geoff, PK, Grover and Brendan. The work that Darren has done on the layouts if fantastic. The whole area around the Ballast Siding has been redone. It now has a small run around siding, and it has incorporated a building that Geoff was getting rid of. It has one less siding at the ballast loading end and a ‘headshunt’ siding has been installed at the other end, to service Geoff's building. The scenery work that Darren has undertaken around this area is great. Darren has also purchased maybe a couple of hundred trees, and these are starting to spring up in clumps around the layout and look fantastic. I think I can see a bulk order for the same types of trees coming in June on my layout. During the day, quite a few trains where run from end to end on the layout by various drivers. We always knew when Shelton was running a train, as occasionally the layout would go silent, as he ran into a wrongly arranged set of points. At least PK said it was Shelton. Darren arranged a great BBQ for us, so we were well fed. I can’t wait until Darren has his next Operating Session. When I got home, David and I went down to my shed. for a few minutes. Following the visit to Darren’s, and seeing a couple of vary large termite mounds at his place, or up his street, and also seeing quite a few the previous Sunday when out on the 620/720 railmotor on the trip to and from Casino, I decided to try and make a couple on termite mounds. So out came some plaster, some yellow ochre and voila. Quite a few (maybe over a hundred) small termite mounds were created and allowed to dry. Hopefully when I next get down to the shed, I will be able to use a couple of dozen mounds around the layout and maybe quite a few more, might be destined to some mates layouts. Last Sunday Darren dropped over to my place and we then caught the bus into the city. We then walked to Roma Street Station and up onto Platform 2. We wanted to see where the Railmotor might be. There was a chance that it could have been in the headshunt on platform 2 or it was yet to come in from Acacia Ridge. Well it was sitting in the headshunt. We were soon joined by PK who was also coming on the trip with us. The points were already set to take it to Platform 3. So we took some photos and then made our way to Platform 3. The railmotor then made its way to platform 3 and we got some photos with the crew. The crew were Darren’s mates from Pac Nat days – Ben and Laurie – What a nice bunch they were. We also caught up with a few mates on the train. Bill and his wife and another friend, as well as a number of railway related people that we knew. I could not resist taking this photo. It is Bill and Ben, and it must mean that Darren is Weed. The old guys will work this out. Today’s trip was to go to Kyogle for people to disembark, or if they wanted to head down to Nammoona crossing loop and then come back to Kyogle, pick up those who alighted and head back to Roma Street. We were to be on the 621/721 railmotors from the Railmotor Society at Paterson. 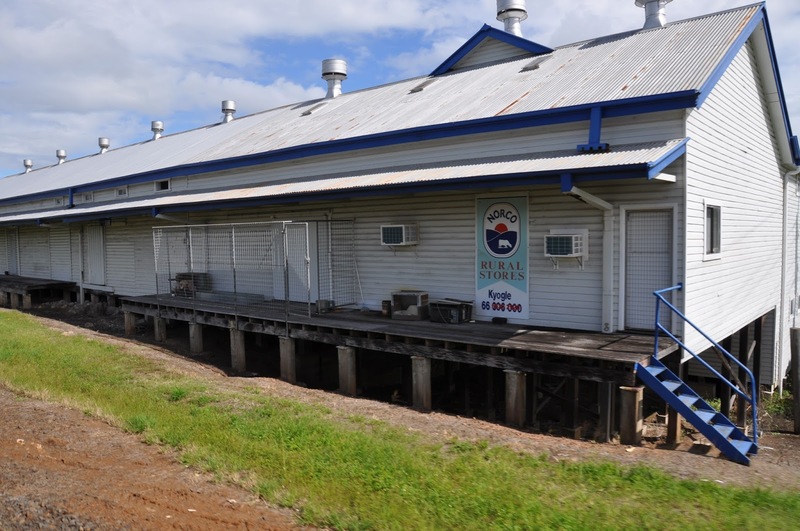 The trip was arranged by the ARHS – Qld Division. Before leaving I had asked Ben if he could swing an extension through to Casino. He advised that he was puzzled why we did not go there in the first place, given that Nammoona is about 5km from Casino. Initially given an Amber signal. Then it turned to Green. The railmotors left Roma Street on time, but then made a slow trip to South Brisbane and then through to Park Road where we stopped for a few minutes. Ben was like a kid with a new toy. His frantic use of the horn must have been capturing people’s attention. We sat there for quite some time. From then on we were about 17 minutes late. No doubt we were waiting for a coalie or grainie coming over the Dutton Park Flyover heading to Fisherman Islands. I thought ‘Oh No’, I hope the rest of the trip is not this unlucky. Well it was just fantastic from that point on. Little by little, the crew gradually made up time. Upon passing through Algester, we were able to see Lefty and Son waving to us from their back yard, just before we passed over Sheep Station Gully. While at Roma Street, some advised that train tracker was advising that the SCT train was still around Nana Glen and running late. Well we were eventually advised that we were to cross the SCT freight at Nammoona, and as such, we were to head to Casino. Good things come to those that wait. I was able to get some video coming into Casino. While on the platform at Casino, I thanked Ben for taking us to Casino. 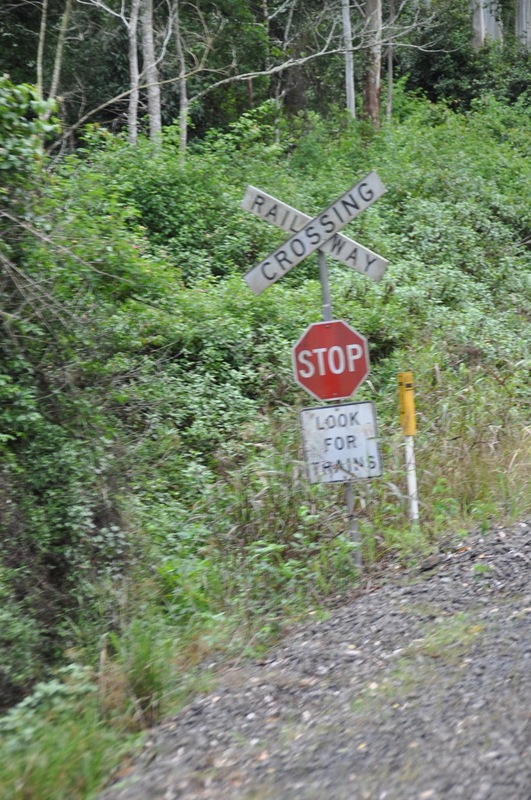 He also advised that the Railmotor hit 115km/h a couple of times on the trip down. That seemed like it was really hooting. Not bad for an old girl like the 621/721 is these days. We eventually reached Casino at the time we were supposed to reach Nammoona Loop. Hey look! Santa was on the train and next to him is Darren. I took a few shots of the houses that back onto the railway line at Casino, the Hotham Street level crossing, and the Meatworks at Casino. I also then took a video of passing through Nammoona Loop. Which is where Ballast is loaded and previously Cattle were loaded/unloaded. We then had to wait until the SCT freight reached Kyogle Loop before we could head north. Up one of the streets at Casino. We eventually were given the road and headed off to Kyogle to pick up those that decided to get off there on the way down. We got there about 18 minutes late and we were underway straight away - 4 minutes down, well for about 3 or 4 kilometres. 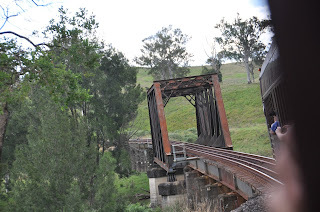 When we got to Kyogle Loop, we again had to wait for the SCT freight to reach Loadstone Loop. From this point in time, we did not see the freight until we passed it, when it was securely sitting in its terminal at Bromelton. It was amazing passing over the Border Ranges in both directions. We go photos of the Cougal Spiral, a very nice water fall just south of Glenapp, and who would have guessed it, it poured as we passed through the ranges in both directions. It was fine on either side of the border. I let PK have the window set on the way back. PK captured some absolutely stunning photos, of some bridges, old houses, and the Water Tank at The Risk. The only thing left there. PK had a huge zoom on his camera. The Railmotors got back into Roma Street about 4 minutes early. They certainly were hooting along the track. Could belong to someone we know. 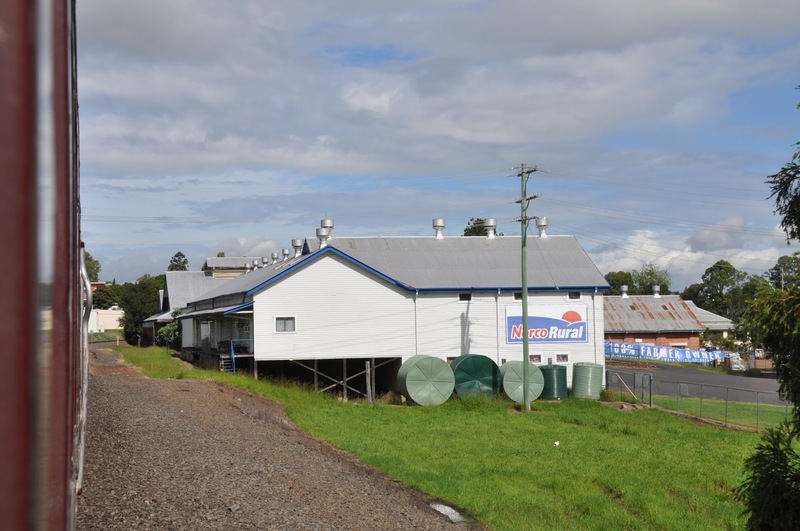 The Norco Building at Kyogle by PK. 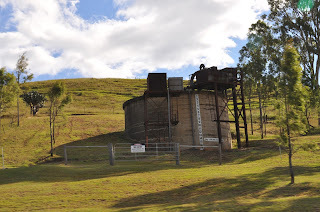 The water tank at the former crossing loop of The Risk, by PK. Going through the old Border Loop area by PK. 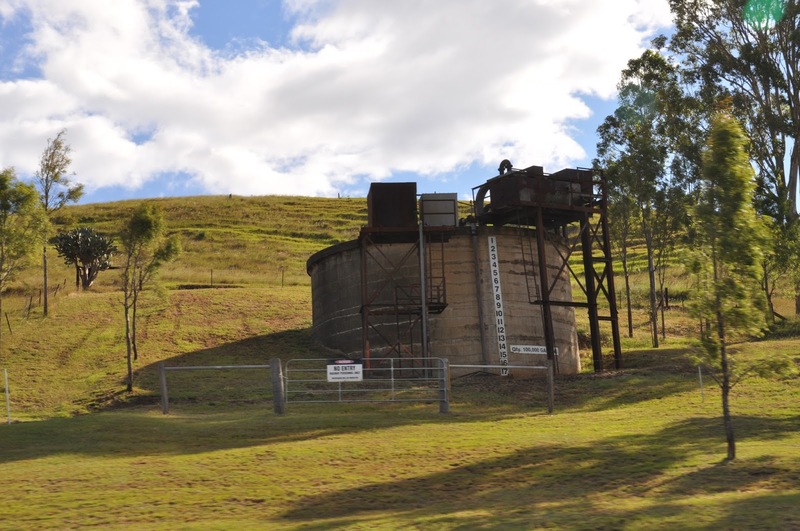 The Water tank at Glenapp Loop by PK. New set of dual gauge points going in at the southern end of Greenbank Loop, by PK. Other end of the point, by PK. What a fantastic day! Great company with Darren and PK. Last Monday while still on holidays, I completed the detailing of the dual control water columns that I received from Jim Hutchinson on the Saturday. I touches up the paint on them and then set about installing them in one of the crossing loops. These two went into The Risk Loop. One at each end. I had to scrape away some of the ballast back to the cork underneath and then drilled a hole for the mounting sprue and glued them in. They do not look half bad. I also got my bicentennial 38 out and ran it up and down either side of the water column to ensure it fitted. I think I will need to find quite a few more water columns to put them in other crossing loops around the layout. I might be able to try and create some near enough looking copies out of styrene, who knowns. This will be a project for a few weeks time on my modelling desk at the Brisbane May Model Railway Exhibition. Yesterday I ventured down to the shed after lunch and I gave my NR class loco a run. It probably hasn’t run for a couple of years. I did find a length of track that I had just ballasted which I had not cleaned the rails. You guessed it, the loco came to a sudden stop with all the glue still on the top of the rails. The NR loco ran to all points of the layout. Its load was my dynamometer wagon. It started outside Grafton Loops and ran to Cassino. That is a distance of 21.9 metres. From this point it is a further 38.8 meters to Murwillumbah stop blocks. From Cassino to Acacia Ridge, it is approximately another 79.5 metres. Thus the distance to Grafton to Acacia Ridge (at the dual gauge take off point to points further north) is a total of about 101.4 metres. From here it is just over 20 metres to Dutton Park and approximately another 9.5 metres to Fisherman Islands stop blocks. From Dutton Park to South Brisbane Interstate stop blocks it is 13.7 metres. That makes South Brisbane Interstate over 135 metres from Grafton. Today a few of us went for a trip on the Railmotor Society’s 620/720 set from Roma Street Supposedly to Nammoona Crossing Loop, but it was extended right the way into Casino. What Luck! But I will post about this trip later during the week along with some photos. This week was interesting. I helped my daughter and one of her friends make a Mangonel catapult. The thing was about 60cm long and 30 cm high and actually worked! The girls helped with the screwing and the sanding of all the wood cuts. The contraption actually sent a rubber ball through the air for about 4.6 meters. They were rapt with the result. On Tuesday model railway activities were back on the agenda. I visited two local hobby shops, Hobby One and Austral Modelcraft checking out what sort of bridges they had in stock, but also looking for ballast. Both shops had various bridges available, but I decided not to purchase one, and neither shop had any Australian ballast. They only had the woodland scenic rubbish. That evening, I had 11 guys come over for our fortnightly get together. So I had to give the shed a bity of a clean in the arvo. As I was attempting to vacuum the shed, one rather newish (still under warranty) vacuum cleaner blew up, so I had to do it with a broom and dust pan. The vacuum cleaner has since been refunded, as it still had time left on its warranty, otherwise it was going out in today's curb side council cleanup. Thursday I visited Simon Says Hobbies and Games, and decided to buy a bridge from his shop. I also purchased a number of electronic components from Jaycar, so I could make 10 power supplies that rectifies the DCC track bus and produces a 12V DC power source. I soldered up 5 of these power supplies, and eventually installed two onto the layout bus. One was located at Fairy Hill Loop signalbox and it powers the headlights of a car parked nearby - maybe someone was visiting the signaller, or it was a crew car for a change over job. 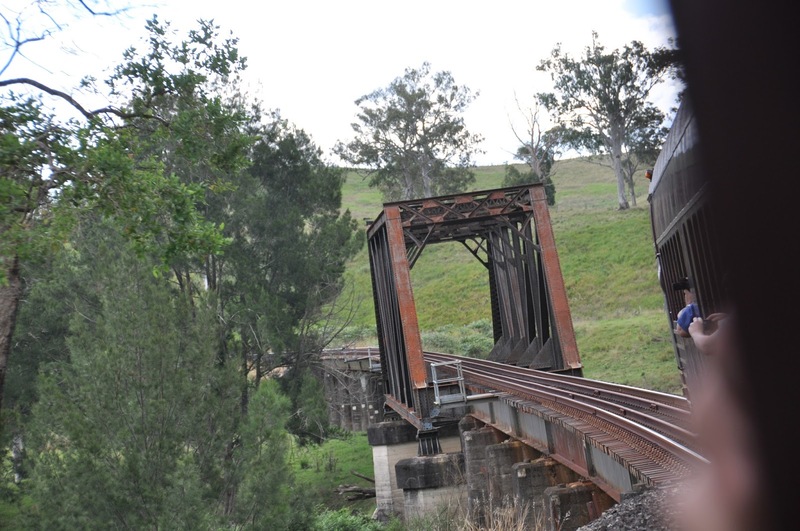 The second power supply was located on the Summerland Way underbridge at Kyogle, and again powers another car. On Friday night I ventured over to Brendan’s place for a BBQ snag, and a modelling night, with Geoff, Darren and Anthony. I started removing components from the bridge kit and cleaning them up, ready for assembly. Maybe assembly is next week’s job. On Saturday, it was Club day, so after missing the last 2 meetings, due to cricket activities with my son, I was able to make it over there. There was also one presentation by a club member about Engine Driver/Wi Throttle integration into JMRI and customising the function button descriptions on your throttle for a particular locomotive. That was good stuff to know and the presenter has developed a process for a member to bring his .XML file from his home layout for any number of locomotives with his function key descriptions setup, e.g. Brakes, Coupler Clank, Dynamic, etc. and then copy it to one of the Club PC’s and automated jobs will copy these to a particular layout JMRI PC, either the N scale or HO scale layouts and once JMRI has been refreshed, those function descriptions will appear on your throttle at the Club. Pretty Good stuff. There was also a discussion on the scenery and industry plans on the top deck on the HO layout. This also was pretty interesting and was very helpful. After the meeting I met up with Jim who was having a clean out at home, and he donated to me two Lloyds dual control whitemetal water columns, a styrene 20,000 gallon water tank, about 10 x 20’ containers (five were refrigerated ones) and a shed. These are destined for the layout. Thanks Jim. Today I painted up the two water columns with silver and black paint. So they will be fine detailed tonight/tomorrow and placed on the layout soon after. With the week starting with a public holiday and ending with me on holidays, it was a great week. I believe some other activity of quite some note also occurred nearby as well. It might have been the Commonwealth Games! So the TV’s in the house have been getting a workout with me watching everything that moves. I am just so lucky that I have a TV in the Shed. This enabled me on Monday to do a bit of ballasting. 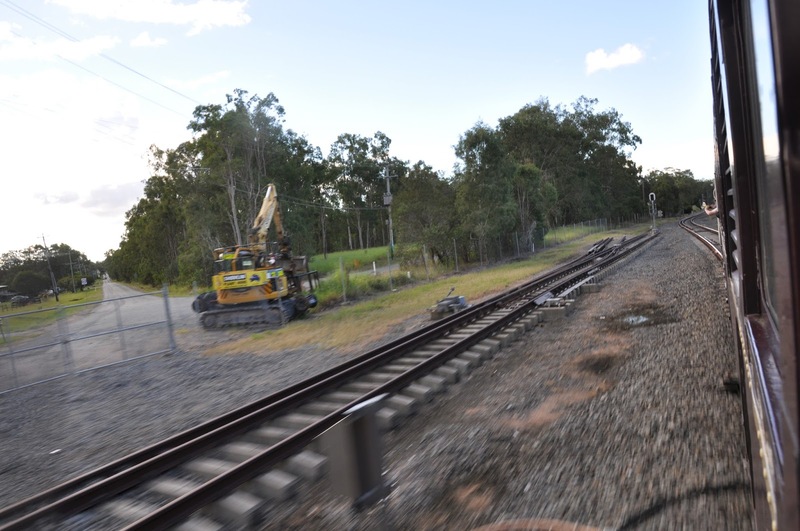 I laid ballast through the front accessible section of Kyogle – maybe about 2m of track in both loops. I then added ballast to the track north of the future river and bridge at Lismore to the first tunnel north of Lismore about 60cm of track. I also ballasted the Cassino Meatworks siding. This was just over a metre of track. I also did another 30-40cm of track north of the points at the meat works up to the Hotham Street level crossing to the southern end of Cassino. On Tuesday I continued working in the same area. I did some baseboard work for the road underbridge at the northern end of Lismore. I then cut some foam and glued this in to place to make the cutting in this location. 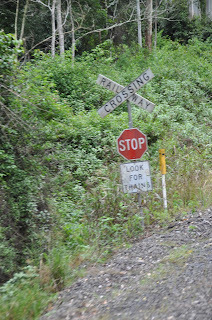 Following this, I ballasted the visible track on the spiral north of Lismore heading towards Murwillumbah. This is about 2.5 to 3m of track. The ballast crew then went north on the main line and about a metre of track at the northern end of the Glenapp Loop towards Beaudesert Rd level crossing was also ballasted. The next day the work crew mixed up a couple of loads of plaster and plastered the cutting and the road underbridge abutments at Lismore. I also glued down the ballast at Lismore around the spiral towards Murwillumbah that I laid the day before. On Thursday I painted (actually stained) the road surface with my standard ink wash, and then painted the sides of the cutting and the abutments on the road underbridge at Lismore. While Fairy Hill Loop was the first section of track on the layout that I ballasted, the just loop sat there incomplete ever since. So the ballasting crew started ballasting about 10 cm south of the loop to where the ballasting in the loop started, and then added about another 50 to 60 cm of ballast at the other end of the loop. I still have about 30cm of track in the loop to complete before I head further north to Kyogle, but I ran out of that colour of ballast. Attention then tuned to Lismore Yard. The section of track between the two cross over points to the yard behind the platform was then covered with ballast. But again I then ran out of that colour ballast. So I am now out of all usable ballast at home. A few weeks ago I had 4 Kg and I thought that I had more than enough to complete the layout/. I guess that the layout is just a bit bigger than I thought. As the sections of track were ballasted and allowed to dry and set, the following day I checked them all out and with almost everyone I followed up with another drizzling of my diluted glue mixture. All are now rock hard and are looking quite good. On Saturday I just went round and cleaned the track with a track rubber at all the locations that I was spreading ballast and glue. This should make the track usable when I get around to running my next train. Today I decided to break out a couple of bottles of previously made up scenery paint I had sitting around on the layout and covered a couple of small sections of white plaster into a brownish undercoat. Again a small amount of further progress. So over the last week, I have laid another couple of Kg of ballast around the layout. The issue is I am again out of ballast. 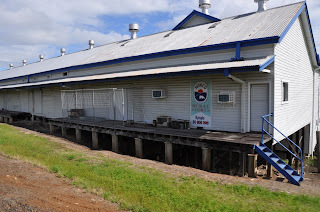 I will have to wait until the May Exhibition on Brisbane to get my hands on some more ballast. 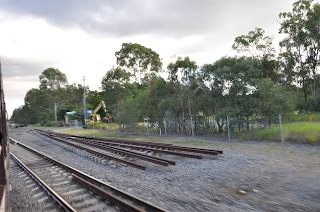 And judging by the past work, it looks like that I will need another 2 Kg of ballast alone to complete Cassino North Yard, 1 Kg for Old Cassino Station and Yard, about 1.5 Kg for Kyogle Yard and the track south towards Fairy Hill Loop, another 0.5 Kg to finish off Lismore Yard, probably 0.25 Kg for a section of track between Old Cassino and Lismore, and then I have all of Murwillumbah Yard to complete. That will take over 2 Kg of ballast as well. I had also forgotten about Rappville Loop, and I’m sure that is well over 1 Kg of ballast required there as well. I bet that I will not be paying the same for this next shipment of ballast that I did for the last. The last lot I got was $5 per kilo at a Buy and Sell! Also back on Monday I completed my first draft for the Modelling the Railways of NSW Convention presentation in May. I also got to switching out the batteries in my Fleischmann Dynamometer car. So that is now operational again. So I might give it a run this week to just re-measure some sections on the layout. It looks like that my NCE order is still weeks away from arriving. So that has stuffed my next week of holidays. I’m sure I’ll find some things to do, like watching the TV for the next week of Commonwealth Games activities and I’m sure I can spend some time in the shed. Well with the long weekend and the beginning of a couple of weeks off work, I decided to take it pretty easy in model railway activities. Instead I mowed the lawn and washed the car. So far I have only been down to the shed for about an hour today before having to undertake more family duties. I did get out my notes for the presentation that I am preparing for the Modelling the Railway of NSW and made a few additions and changed a few things. This will switch into top gear on Monday, when I hope to complete my first draft of my power point presentation. On Tuesday evening this week we visited David’s place for our fortnightly gathering. His layout wiring is progressing well and very logically. The rest of the crew (I think) have talked him into adjusting the sharpness of a curve leading to a bridge. I tried to get him to change this many months ago and he did not pay any attention. I’m sure it will remove any potential operational issues and make the layout more enjoyable to operate. I think we also talked him into making some adjustments to the point work around his second major station, so he can introduce more operational flexibility when he eventually runs the layout. Somehow later in the week, my brain then got to thinking about a level crossing flasher controller. 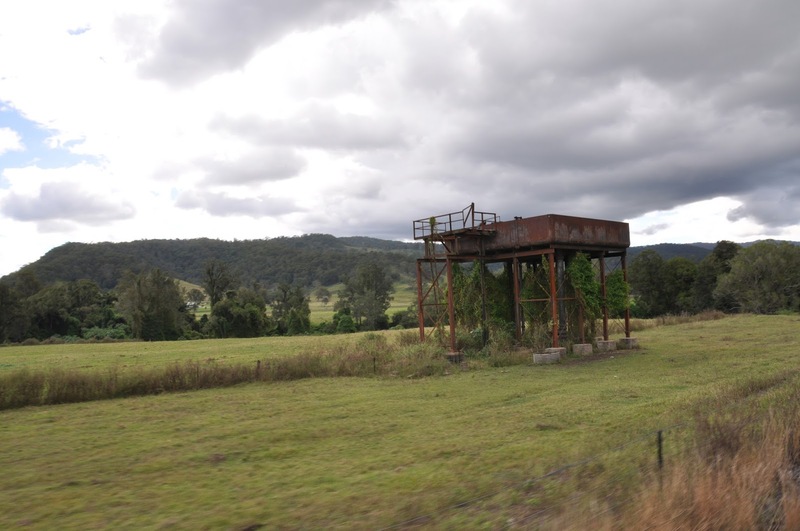 I had always wanted to implement an automated controller setup across my Bruxner Highway level crossing just south of Cassino and had started thinking about this a couple of years back. But all that was put onto the back burner, so much so that I forgot what I have already purchased and how it was going to be put together with various electronic components. After doing some reading this week, I think I can just do all of this operation just with a mini panel and some track detection. I’m still waiting for a new Mini panel to be delivered to my local hobby shop for another purpose, so I might have to get a second. Maybe this next week, the wanted delivery will arrive and then I can use the second week of my holidays experimenting with how I will get it all wired up and what the code in the Mini Panel will look like. So today in my hour in the shed, I extended the ballast in Glenapp Loop another meter and this location is now complete. Maybe tomorrow, it will be glued down as well. I also went over all the ballasting I did last week and checked that all the points still worked - which they did, and that the ballast had been glued down and it had. But for good measure, I did a quick dribble of glue over all the track one more time. As I was working in Glenapp Loop, I accidentally pulled some wires from the baseboard above and had to get the soldering iron out to fix these. I also noticed that two wires had come from my line of Ammeters on the Control Panel. I think this occurred with all the jig sawing I did last week on the baseboard just a couple of feet to the right of this point. But again, I just re-attached those wires and all is now good.